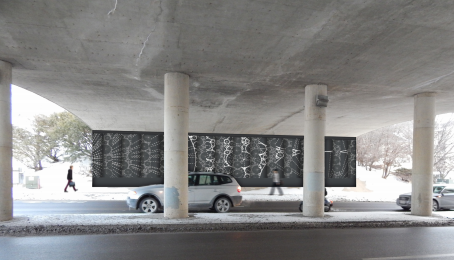 The RNA, City of Madison Planning Staff and 1000 Friends of Wisconsin are working to bring art to the neighborhood's Walnut Street and Highland Avenue underpasses. Here are some images from Julia Schilling's "Dynamic Experience" treatment for the Highland Avenue Underpass. To support this project contact the RNA President. To review Professor Sam Denis' class projects open the Underpass Art document. The accordion-style form of this proposed lenticular wall emphasizes the movement of Highland Avenue. Each person’s individual pace and curiosity determines a unique experience beneath the underpass creating a dynamic, people-activated space with every step, tire revolution or shifted position. Addressing aspects of aesthetics and safety, back-lit panels produce a glowing atmospheric effect reminiscent of a constellation. Photovoltaically powered LED light fixtures are mounted to the existing concrete wall to provide a sustainably sourced, welcoming night time experience.